The compound bow is currently the most popular type of bow among archers and bowhunters. This technologically advanced bow offers many advantages which make it perfect for a variety of activities – anything from hunting to target shooting, and even competitions. Due to the advancements in technology and design, it’s easier to draw, more accurate and more powerful. Therefore, proper technique should always be used to get the most out of every arrow shot. As always, there are tips and key points to take into consideration when it comes to shooting a compound bow as accurately and safely (for the archer/hunter and the bow) as possible, most of which you can find in this article. As with everything else in life and sports, the perfect technique takes time and practice. It won’t happen overnight, but if you decide to insist, the final benefits you’ll reap will be worth it. So, what is it you should always keep in mind when shooting a compound bow? 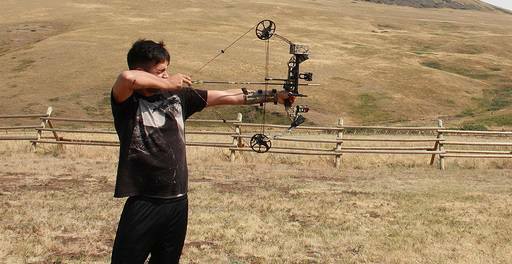 Whenever you’re handling a powerful weapon such as a compound bow, you should make sure you’re standing in a position that feels natural, comfortable, stable and in line with the center of your body. Everything from the way your feet and hips are positioned and to the way you center your torso can have a big impact on your accuracy and shooting. The ideal stance is to keep your feet shoulder distance apart and then try to see which position fits you best, starting with your feet and hips perpendicular to the target. Usually, the body tries to align itself with its own center, so it might take a bit of trying out different positions to figure out which one suits you best. However, regardless of your feet position, you should always make sure you stand up straight and keep your neck in line with your spine when turning your head towards the target. Any kind of tilting or bending will strongly (and negatively) affect your shooting. Understanding which is your dominant eye (the one that does most of the work and is basically the one you see with) has a great positive impact on the technique and, consequently, accuracy. It will help you understand which eye is the one you’re really using when shooting and adapt to it. Some archers even close the other eye or wear patches to avoid distractions, while others learned how to shoot with their both eyes opened. Furthermore, compound bows are usually used with a peep sight. Make sure you install yours in the optimal position according to your dominant eye, stance and form. The simplest way to do it is to draw your bow as if you were to shoot, close both of your eyes and then open your dominant eye. The part of the string you see right in front of you is where you should install your peep sight. The grip plays a big role in the accuracy and speed of each arrow shot. When holding your compound bow, you should make sure the weight of the bow is evenly distributed in the space between your fingers and your thumb (the center of you palm). If you feel that you’re holding the bow with your wrist or your fingers, you should try and see how to improve your grip. A commonly used technique is to make an L with your index and thumb and then placing the bow so it lays aside your index finger and the center is in the “corner” or the L.
At all times your fingers and palm should be as relaxed as possible. Holding the bow too tightly can make it twist when fired, and not holding it tight enough will prevent you from making the perfect shot. The trick with drawing and anchoring to consciously control the movement and to always pull to the same position. There are two common anchor points to help define and repeat the perfect position – the point when your bow is fully drawn against your cheek, and the tip of your nose on your string. However, although the practice is of the utmost importance, what’s even more important when it comes to drawing and anchoring is consistency. To perfect this movement, it is recommended to perform it as often as possible. When aiming, keep your eye on the target, your chin parallel to the ground, relax and breathe. Take as much time as you can handle, and pay attention to any unnatural twisting of your back or neck, or gripping your bow too tight, to correct them before releasing. When using a compound bow, most archers choose to use a mechanic release as it improves the accuracy by providing more stability than releasing with fingers. It’s very important that you’re perfectly calm at the moment of release. Any tensions in the wrist, neck, back, hips, arms, etc., can make your bow twist at the moment you release the arrow, making the shot less accurate. Archery is a fun and challenging sport. Every shot you take will help you get better, and even though there are plenty of things to keep in mind, it should be an exciting and thrilling experience!